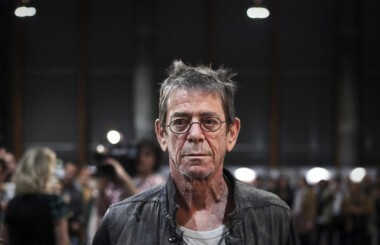 Lou Reed was a capital-R Rock Star, but he was also very much a normal-sized human. If you lived in New York in the last couple decades, there was a good chance you’d bump into him doing something very normal, just like regular people do. Once I went to get sushi at an unremarkable place on 13th Street, and there he was, picking at something with Laurie Anderson. Anyway, just like millions of other people, Lou Reed had a Spotify account. Because he is also a capital-R Rock Star, Spotify occasionally encouraged its users to follow his activity on the streaming music service. So, if you did, you could see what he was listening to. Or, at least, what whoever was using Lou Reed’s Spotify account was listening to. On the Internet, no one knows if your dog is controlling your playlist. With that caveat in mind, here, via the Daily Dot, is what Lou Reed was listening to – and liking – in the past year or so. Reed also had other curated playlists, but this one is worth noting because so much of it will be familiar to the average music fan. Turns out Lou Reed listened to Paul Simon, David Bowie and … Lou Reed. Just like a regular human. And here’s a tremendous Lou Reed performance from 1974. RIP. * I do have a much better Alec Baldwin story. It is not risque, but it is sort of unbelievable. Yet there are many witnesses. According to numerous sources inside Yahoo, CEO Marissa Mayer has ordered up two under-the-radar initiatives – well, not to me and now you! – that could potentially get the company back into algorithmic search as well as search advertising. The internal code names for the efforts – which are not actually being done together, though they are in tandem – are borrowed from sports. In this case, basketball and baseball: Projects Fast Break and Curveball, respectively. Sources said the plan is being done as part of a contemplation of how Yahoo can accelerate the end of – or actually end – its longterm search and advertising partnership with Microsoft. Currently, Yahoo only has control over the search experience, but Mayer clearly wants more purview over the business. Drawbridge, an ad targeting startup backed by Kleiner Perkins Caufield & Byers and Sequoia Capital, is expanding its offerings today with a new feature allowing mobile advertisers to reach consumers with retargeted ads, regardless of whether they’re using an app or on the mobile web. Founder and CEO Kamakshi Sivaramakrishnan said that while ad retargeting (i.e., ads targeted based on your past visits and activity) is possible within apps, things get trickier when you try to cross the boundary between apps and websites: “It’s literally two devices on the same device, separated by an iron wire.” (I question her question use of “literally”, but I think you get the point.) App developers can also try to reengage their users through alerts and notifications, but users can always turn those off. In order to solve that problem, Drawbridge is “piggybacking” on its core technology. That technology examines user activity to help advertisers identify when multiple devices are likely being used by the same person. That allows advertisers to use data collected on the desktop to target ads on mobile. The company’s two products launched last fall include PC-to-mobile retargeting and mobile app marketing. The mobile-to-mobile retargeting is intended to fill out the mobile marketing product, Sivaramakrishnan said. Drawbridge has already run test campaigns with e-commerce companies, who were either trying to bring old customers back to the site or to convince current customers to buy more. Sivaramakrishnan said that in a campaign targeting lapsed users, the client reached 100 percent return on ad spend within three weeks. Another campaign targeted active users and reached 100 percent ROAS within a single day. Advertisers will have a chance to test this out for themselves, Sivaramakrishnan said, because the new capabilities include an A/B testing framework. So advertisers can run part of their campaign with Drawbridge’s retargeting and part of their campaign without it and see which ads perform better. Earlier this year, Drawbridge announced that it was partnering with TRUSTe to allow mobile consumers to opt out of its targeting. Since then, Sivaramakrishnan said that some users have indeed opt out, but that the rates haven’t been “heavy”. As AllThingsD and others have previously reported, the selection of a new leader to replace outgoing CEO Steve Ballmer is likely to take at least until the end of the year. While that could change, of course, a number of candidates – from an outsider like Ford CEO Alan Mulally to an insider such as Tony Bates – are still being considered and vetted. Omnicom Group Inc. and Publicis Groupe SA, the world’s second- and third-biggest advertising companies, respectively, are near a deal to merge, people familiar with the situation said, creating what would be a $30 billion behemoth. If a deal is completed, it would be billed as a merger of equals. The two companies each have a market capitalization of about $16 billion. Omnicom Chief Executive John Wren and Publicis CEO Maurice Levy are expected to be co-CEOs of the combined company, the people said. An announcement could come as early as Sunday, the people said. Smoshed! Alloy Digital Raises $30 Million for Web Video That Makes Money. New day, new bet on Web video. This one comes from ABS Capital, which is plowing $30 million into Alloy Digital, better known as the home to Smosh. Seriously? Yup, seriously. This stuff is hugely popular, both on YouTube and on Smosh’s own site, which is a crucial part of the story: While lots of YouTube’s biggest stars are trying to figure out how to make money on the world’s largest video site, the Smosh guys — Ian Hecox and Anthony Padilla, both 25 – figured out early on that they wanted a home that wasn’t owned by Google. That has helped them create a business that Forbes thinks generated $10 million in revenue in the last year, and that’s why Alloy bought their services in 2011. Now ABS is putting money into Alloy, which has an array of Web video stars following similar strategies. “The monetization model is Smosh,” says Alloy CEO Matt Diamond. Which means: Attract eyeballs, and some ad money on YouTube, where Alloy says it has more than 12 million subscribers for the channels it owns (unlike other big YouTube players, it doesn’t spend much time representing other people’s clips on the site). Alloy and ABS won’t comment on the valuation that comes with the $30 million A round. But it’s worth noting that last year Maker Studios and Machinima raised rounds of $36 million and $35 million, both of which valued the companies in the $200 million range. It’s entirely possible this deal is even richer. Twitter is testing a new ad unit that gives direct marketers a way to generate leads directly from tweets. You can see an example of the unit in this tweet promoting Twitter’s small business guide. Not only is there a small image promoting the guide, but if you’re logged in, it also shows a “Get it now” button. When you hit the button, you don’t get asked for a phone number or email address – instead, you get a message saying that “Twitter Advertising will reach out soon.” Presumably, the advertiser will get a list of interested Twitter accounts. Twitter says this functionality is being delivered through Twitter Cards, the technology that enables additional media and functionality (like embedding a photo or a video) in tweets. It also says this unit is still being tested. So it could change significantly, or it might not ever see a broad rollout at all. This does seem like something that would be pretty appealing to advertisers, since it gives them a new way to get their messages across, as well as to measure the success of their campaigns in a way that’s more meaningful to them than retweets or clickthroughs to a landing page. Of course, as with any expansion to Twitter advertising, it could also spur some user whinging. For what it’s worth, this sample doesn’t seem particularly obtrusive to me. I’ve asked Twitter for more details about the test and will update if I hear back.